A detailed list of what's new in Compiz 0.9.2 can be found @ Compiz mailing list. 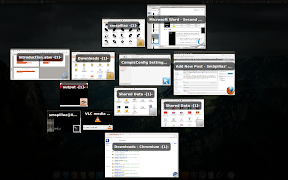 Besides the announcement of Compiz 0.9.2, the post on Sam Spilsbury's blog also specifies the plan for Compiz 0.9.4 which is supposed to support Multi-Touch and Multi-Input, animations framework and massive speedups thanks to the plugins being compiled into core. Note: the videos are not new but I couldn't find any newer videos. Thanks to WebUpd8 reader Deon Spengler for the tip! Image, info and screenshot thanks to Sam Spilsbury (smspillaz).